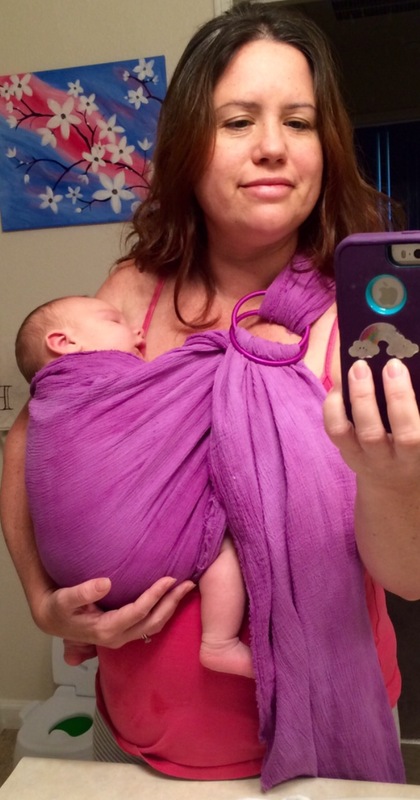 Babywearing DIY Ring Sling – Crazy for D.I.Y. November 3, 2016 November 3, 2016 • Crazy for D.I.Y. Babywearing is amazing! Baby is happy and mommy gets to be hands-free! So, I decided to make a ring sling after I had my second son. I was desperate for a quick baby carrier for my infant with a toddler to chase after and be hands-on. I have an ergo but it’s time consuming to put on and much more efficient for longer carrying like walks. 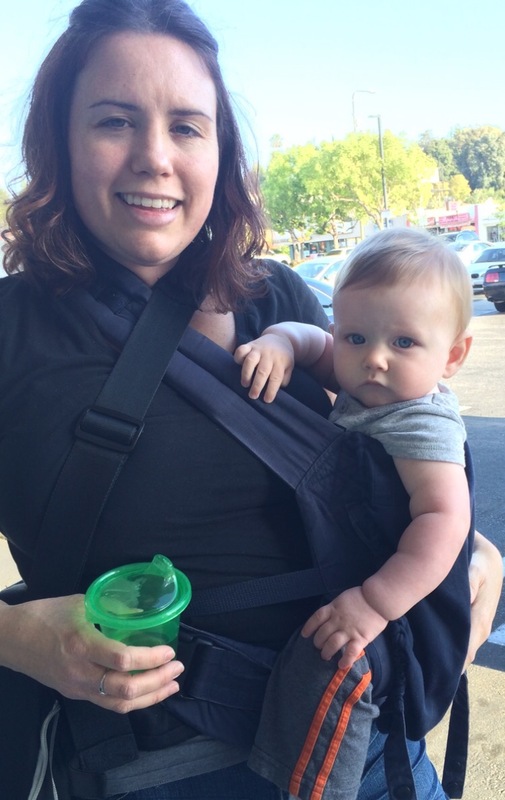 I had a black 100% cotton Moby wrap my friend graciously leant me but it was too thick for my summer baby. Plus, I’m in love with the color purple and really wanted it in a purple hue (to go with my purple double stroller too 💜). I didn’t want to spend a pretty penny. I couldn’t find a good color / print. I wanted an excuse to make something. Light (gauze) fabric with a bit of stretch. 4-way stretch is best. About 4-5 yards. 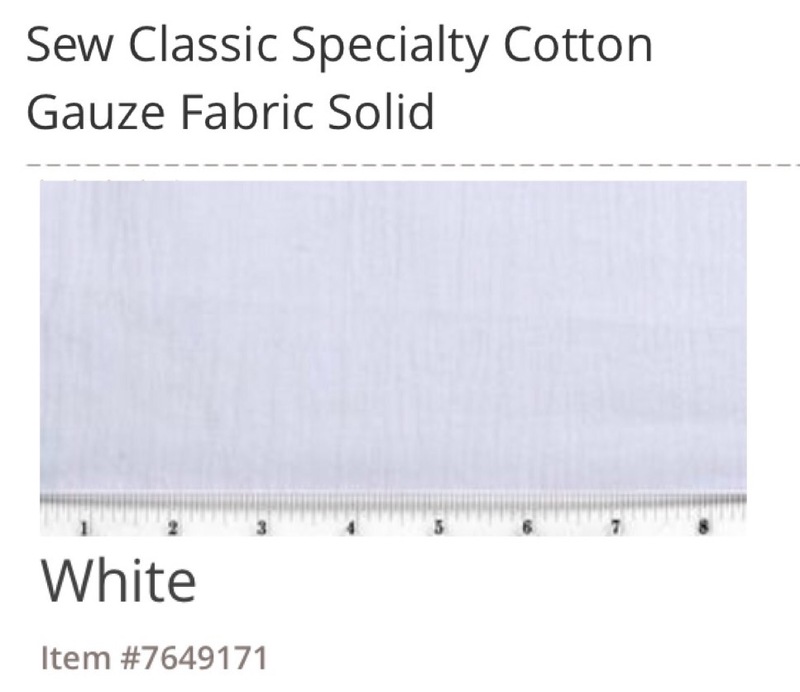 I searched for a gauze type fabric and found this cotton gauze at Joann’s (at the time only white was available). I bought 5 yards. It has a 44″ width which is cut in half length-wise gives you 2 slings @ 22″ wide – perfect! I had a coupon so it was $4 per yard. I’m sure there are better fabric choices out there too. This was the cheap, available route I went with. Next super important items were the slings. My babywearing groups recommended SlingRings.com for the safest ring slings. 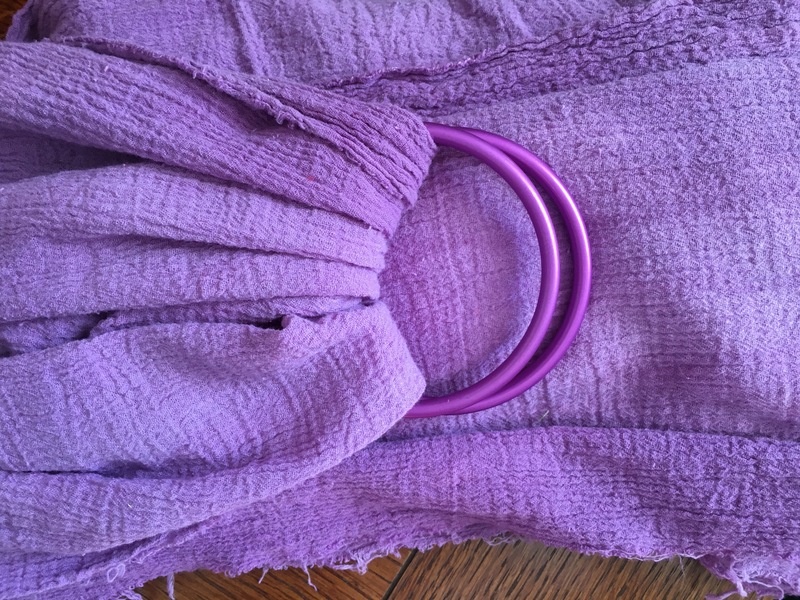 I bought two pair of purple aluminum 3″ Sling rings. $6.50 with shipping. They are awesome! 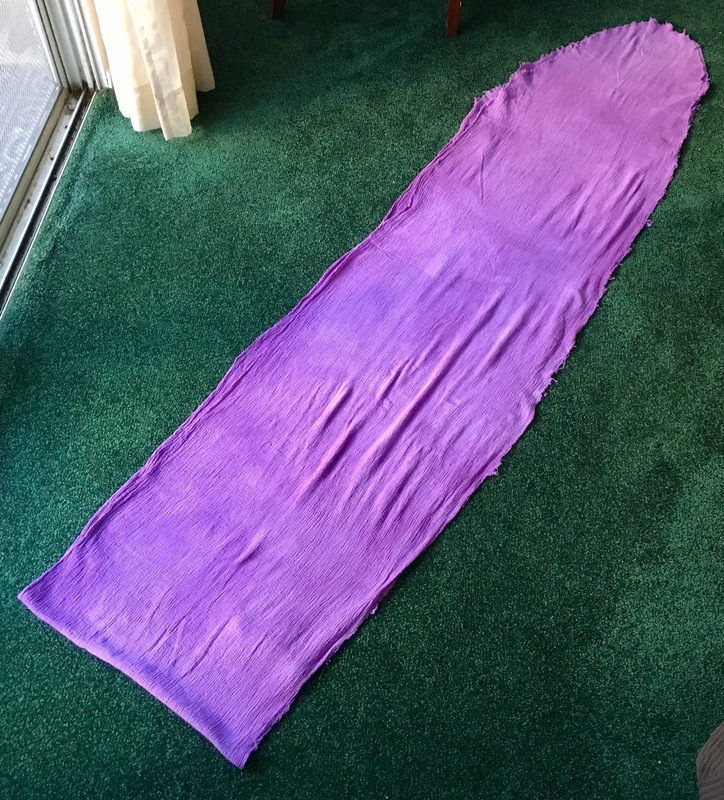 There was a lot of prepping the fabric before dying. I machine washed it and dried in the drier (no fabric softener). After I dyed it, I washed and dried it about a dozen times to soften it up before putting it next to baby skin. I also used the Moby wrap I had as a template for shaping the ring Sling. I could have made this a sew wrap but I didn’t have enough confidence that my stitching would be safe. A no-sew wrap is just folding the fabric in half and inserting rings in the fold. 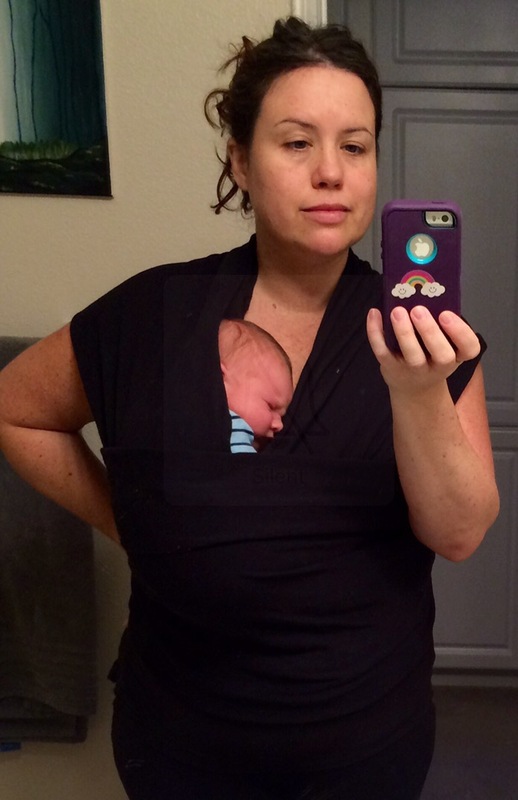 Since the Moby wrap is meant for wrapping around your body a couple times I didn’t have to make it as long as I did. I think 4 yards would have been a perfect length. I must have watched a hundred baby wearing YouTube videos to make sure I wore him right. Once I was done wearing my son I would just loosen up the tied rings and slip it off and leave it close by ready to slip back on, insert baby and tighten again. 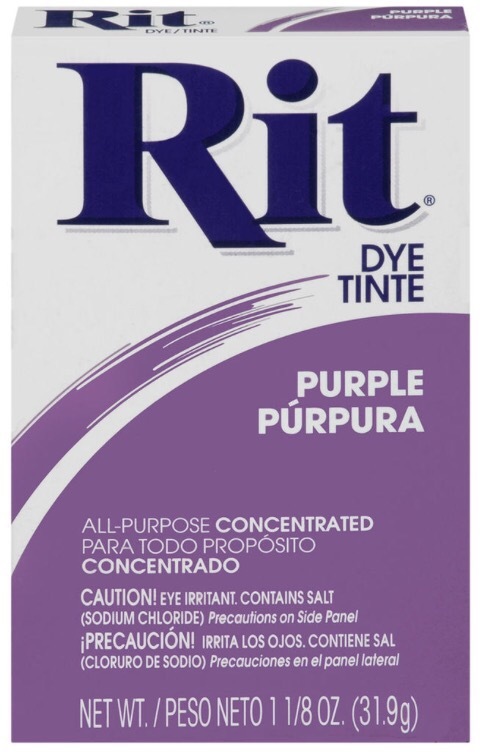 Posted in Baby, SewingTagged Baby, carry, diy, dye, Fabric, gauze, purple, ring slingBookmark the permalink.